Throughout the history of paleontology in China, one institution has always remained at the top. The Institute of Vertebrate Paleontology and Paleoanthropology(IVPP). The IVPP is usually just viewed as a major research institution, but in fact, they have their own display space in a stone addition to their headquarters. This three-story building sits right next to the Beijing Planetarium and Zoo. The display space is divided into two separate museums, the commonly ignored Shu-hua Hall of Paleoanthropology, and the Hall of Vertebrate Paleontology, both making up the Paleozoological Museum of China(PMC). The Shu-hua Hall is much smaller than the Museum of Vertebrate Paleontology, only consisting of two comparatively small galleries. As expected, Shu-hua is all about hominid evolution in China. The aesthetic here almost feels like a display in a mansion, with gold and red walls, and display cases everywhere. The Hall of Vertebrate Paleontology, on the other hand, is entirely different. It’s much bigger, spanning three stories. It’s in a duller aesthetic, but still more modern than Shu-hua. 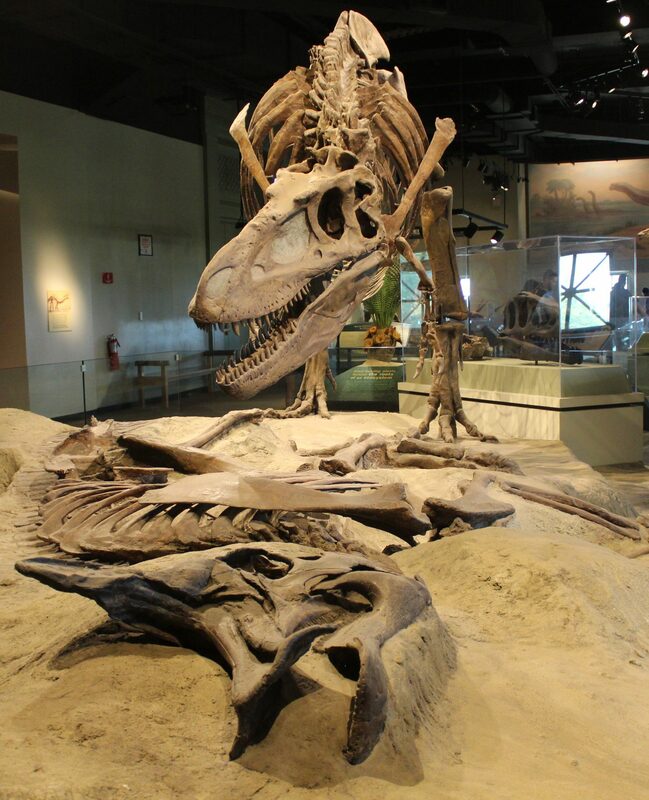 The Hall of Vertebrate Paleontology, accordingly, covers all of vertebrate paleontology, just excluding hominid evolution. These fossil halls show the significance of the IVPP throughout the history of Chinese paleontology. The importance of the IVPP’s history is embedded into these exhibits. The IVPP’s first form was the Cenozoic Research Laboratory, established in the late 1920s to continue work at the Zhoukoudian Peking Man site. This laboratory was one of the first institutions dedicated to prehistory in China, as less than two decades ago, China had still been under dynastic rule. Davidson Black, a Canadian paleoanthropologist that was currently serving as a professor at Peking University, received an eighty-thousand dollar grant from the Rockefeller Foundation to establish the Cenozoic Research Laboratory. In 1934, after Black’s death, German paleoanthropologist Franz Weidenreich took over. In 1937, everything stopped with the Japanese occupation. The specimens kept at the laboratory were locked in the Peking Union Medical Hospital, which was run by America, believing that an American institution would be safe from the Japanese. Four years later, as war between America and Japan became a serious threat, Weidenreich ordered casts of all the fossils to be produced, and the fossils were shipped off to America*. As the Communists took over, the Cenozoic Research Laboratory was turned into a part of the National Planning and Steering Commission for Geological Works. A few years later, it became independent, under the name of the Laboratory of Vertebrate Paleontology of the Chinese Academy of Sciences. Four years later, it changed its name to the Institute of Vertebrate Paleontology, and further changed to its present title in 1960. All the while, the Institute’s collections were growing dramatically, with the work of Yang Zhongjian, and Dong Zhiming and Meemann Chang continued this growth into the 90s. The Paleozoological Museum of China itself was established in 1994. The next leap in the evolution of the IVPP would be in the late 1990s, when exceptionally preserved dinosaur fossils began emerging from Liaoning, with feather impressions preserved. Well, that’s enough of an introduction. It’s time to enter the Paleozoological Museum of China. *The fossils never reached their destination. They disappeared, and the fossils of the pre-WWII Cenozoic Research Laboratory have never been seen again.